The Internal Revenue Service and Treasury Department have proposed new rules meant to block schemes by high-tax states to help their residents avoid new limits on state and local tax (SALT) deductions. The tax overhaul passed by President Donald Trump’s Administration last year capped SALT deductions at $10,000. Ever since, states like California, where the Tax Policy Center says residents deducted $18,438 on average, have been trying to find a work-around. Some of the states looking to offset the SALT deduction cap have settled on plans to allow their taxpayers to claim a charitable deduction for state and local tax payments above the $10,000 limit. This would effectively allow the taxpayers to reduce their federal taxable income by the same amount as before. The Treasury Department said these plans are primarily a tax dodge for wealthier Americans. The new rules from the IRS and Treasury would prevent taxpayers from circumventing the cap by requiring taxpayers to reduce the federal charitable tax deduction they are claiming by the amount of any credit they receive on their state and local taxes. 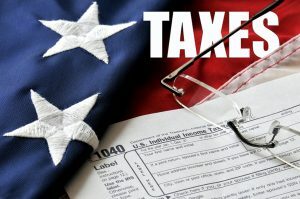 For example, if a state granted a person a tax credit of $700 on a $1,000 contribution, the taxpayer would only be able to write off the remaining $300 on his or her federal return. The new rule is still a proposal at this stage. The IRS will be accepting comments on the rule until Oct. 11 and will hold a required public hearing on the rule on Nov. 5. The rule is expected to be in place by the end of the year. The decisions by the IRS and Treasury have been cheered by those in Congress who voted for the tax overhaul. Rep. Kevin Brady (R-Texas), a lead author of the tax bill, said, “These Treasury regulations rightly close the door on improper tax evasion schemes conjured up by state and local politicians who insist on brutally taxing local families and businesses.” The new restrictions are projected to generate billions of dollars a year in additional revenue to the Treasury.